There he is! 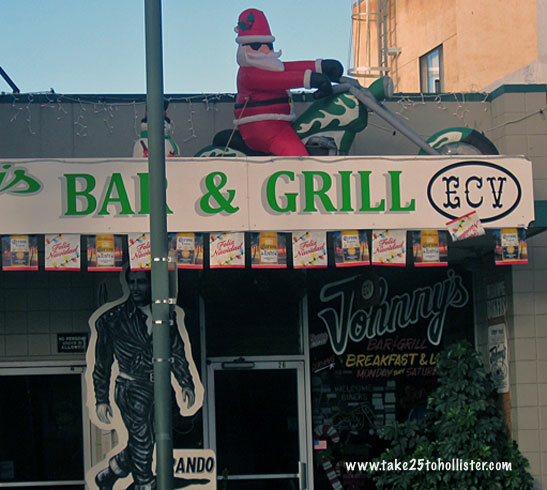 Biker Santa Claus on Johnny's Bar & Grill's ledge. The Hollister Freedom Rally will be ending in a couple hours. The weather has been perfect for the three-day event. Not too hot, not too cold. And, the fog burned off early in the morning. 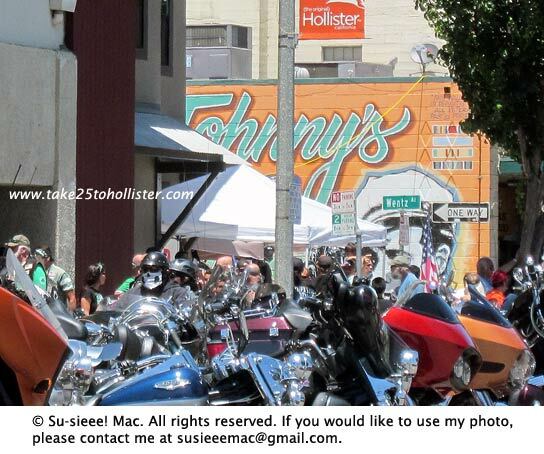 Hope the thousands of visitors and locals who attended the motorcycle rally enjoyed themselves. Hats off to the ConvEXX, the rally's organizer, and to Hollister Police Chief David Westrick for a great job of ensuring a safe and peaceful event. 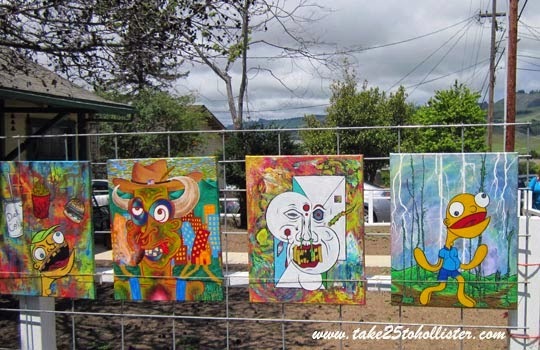 For more photos of the events, check out Take 25's album on Facebook. You don't need to be a Facebook member or sign on to view it. Three More Days Until. 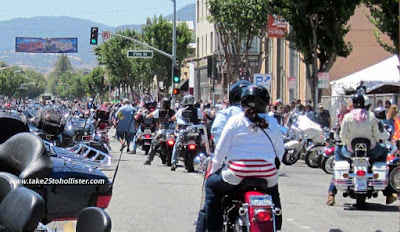 . .
Over this Fourth of July weekend, the number of people in Hollister shall be nearly threefold, if not more, as bikers from all over California, the United States, and even the world rumble in to visit the Birthplace of the American Biker. Lots of activities are planned for this free three-day event, from Friday, July 3, to Sunday, July 5. The Touring Vietnam Veterans Memorial, hosted by the local Veterans of Foreign Wars and American Legion branches, will be arriving on Thursday afternoon. It'll be set up at Dunne Park on Seventh Street. For more details, check out this article. Who's got the best tattoos? Join or watch the tattoo contest at the Veteran's Building Stage. Registration is between 2:00 and 2:30 p.m., with the contest starting immediately afterwards. The Custom Bike Show is a competition of the best bikes in various categories, such as the Best Custom Bike, Best Bobber, and Best Paint. Participants will display their bikes from 9 a.m. to 6 p.m. on the lawn at the corner of San Benito and Fourth Streets. The award ceremony will be 5:30 p.m.
On Saturday, actors Tommy Flanagan (Chibs) and Mark Boone Junior (Bobby) of Sons of Anarchy will be doing a Meet & Greet at the Veterans Memorial Building, from 10 a.m. to 6 p.m. Starting at 6:15 p.m. on the 7th Street Stage will be the Ms. Hollister Freedom Rally Contest. For more details, click on this link. Bands will be performing on three stages in Downtown Hollister. Music will run on Friday and Saturday, from 12 to 6 p.m., and on Sunday, from 10:30 a.m. to 2 p.m. For the schedule of bands, visit this page. Live performances will also be happening at Bolado Park, the official campground for the Motorcycle Rally, on Friday and Saturday. Many local bands, such as Change in the Weather and Kizmet, will be performing there from 3:30 p.m. to 10 p.m. Admission fee for non-campers is $10. Check out this link for the schedule. 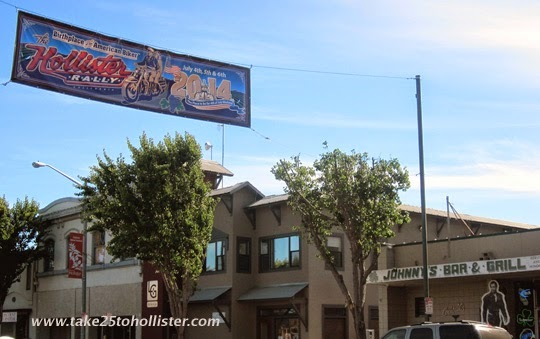 This year, the rally will feature big-time concerts in Downtown Hollister. The streets will be rocking and rolling with The Fabulous Thunderbirds on Friday and The Guess Who (yes, the Guess Who!) on Saturday. Both concerts start at 7:30 p.m. You can purchase tickets online at the Hollister Freedom Rally web site. There's a lot more going on. 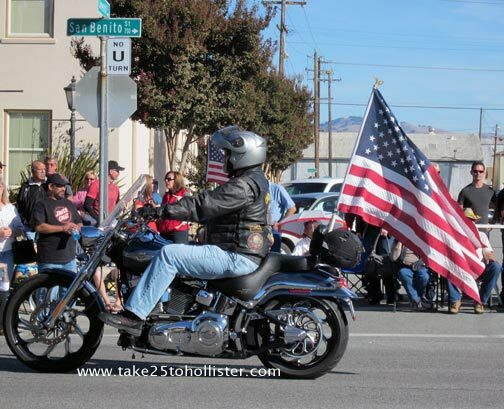 Check out the Hollister Freedom Rally web site and Facebook page for more info. 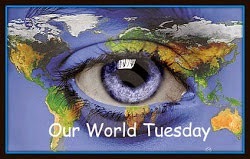 Today, I'm linking up with Our World Tuesday. Click here to check out posts from participants from around the world. 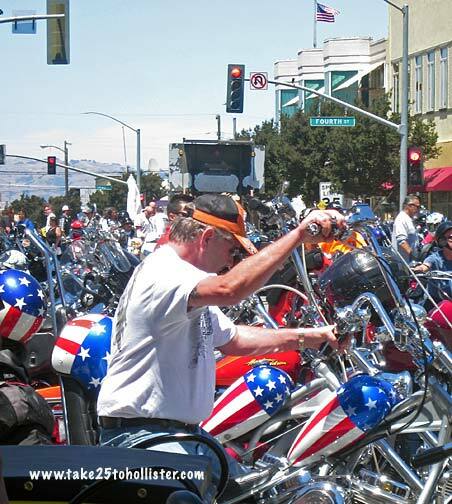 Tens of thousands of bikers, non-bikers, families, locals, and out-of-town visitors have been having a ball these past three days at the Hollister Rally. Today, the three-day motorcycle and music street festival will end at 3 PM. And the downtown streets are expected to open around 6 PM. 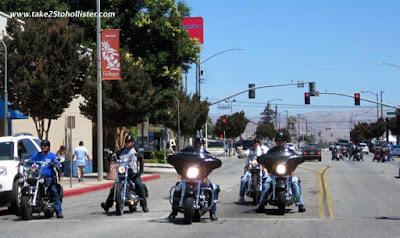 Driving through downtown Hollister yesterday evening, the Husband and I noticed motorcycles already lining San Benito Street. The fun has started. Have a joyful, peaceful, and safe Fourth of July weekend celebration, one and all! Are you ready for the 2014 Hollister Rally? Come two weekends from now we will have thousands of visitors in our town and county, enjoying the annual biker festivities. The event will run from 9 AM to 9 PM on both Friday (July 4) and Saturday (July 5) and from 9 AM to 3 PM on Sunday (July 6). 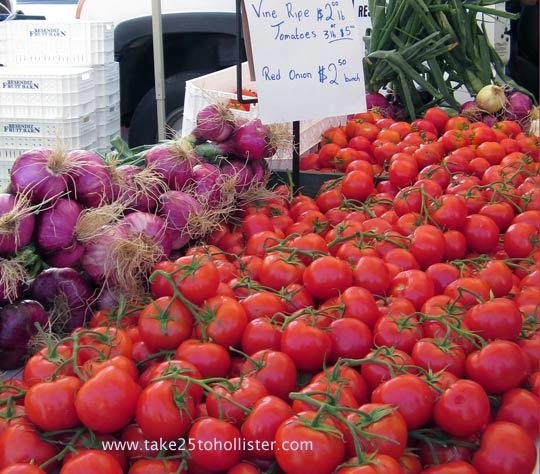 To learn more about the schedule and vendors, head over to the Official Hollister Rally website. 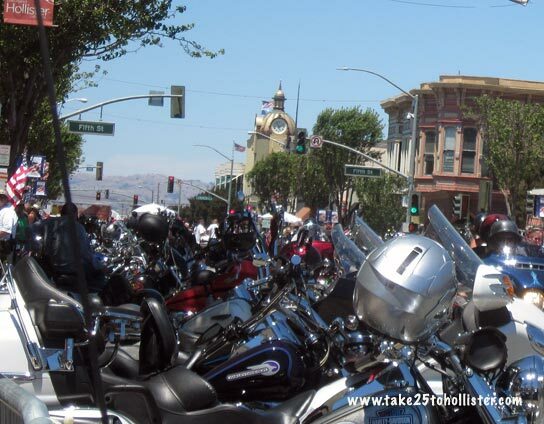 And, if you'd like to know how Hollister became known as the "Birthplace of the American Biker" and how this annual motorcycle rally came to be, check out this Take 25 to Hollister post written in 2008.
Who else agrees that the Hollister bike rally was fun and well-run? Congratulations to Mark Cresswell of Worldwide Dynamics for doing a wonderful job organizing and managing the 2013 Hollister Rally. Much appreciation also goes to our new Hollister Police Chief David Westrick for such a great job leading law enforcement for the event. And, many thanks to the thousands of visitors over the last few days to our city. Hope you enjoyed your visit. The motorcycle rally may be over for this year, but the biker-inspired exhibit, Freedom, Rebellion & Adventure, continues at the Blak Sage Gallery until July 20, 2013. The exhibit includes works by Rob Campbell, creator of the "Keeping Up with Jones" comic strip, photographs by Michele Esposito, and sculptures by Paul Loughridge. 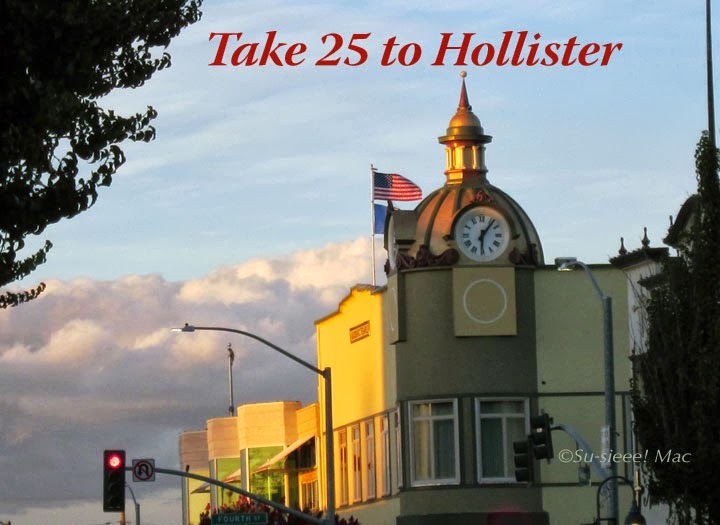 Take the time to enjoy it, the next time you're in downtown historical Hollister. 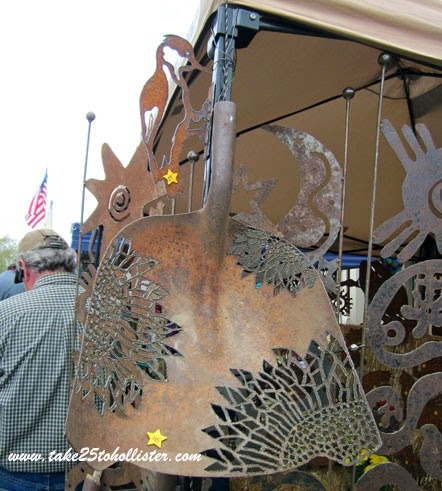 Loughridge inspires me to try my hand at putting together odds and ends of metal things to create something spectacular. Something I've never done before. My favorite Loughridge sculpture is called "Evolution (bone/wrench)", which he created out of a vintage bicycle tank, meat grinder handle, flex gas line, propane carb, toilet seat hinges, and a turkey baster. Brilliant! My second favorite is the red truck in the photo above. 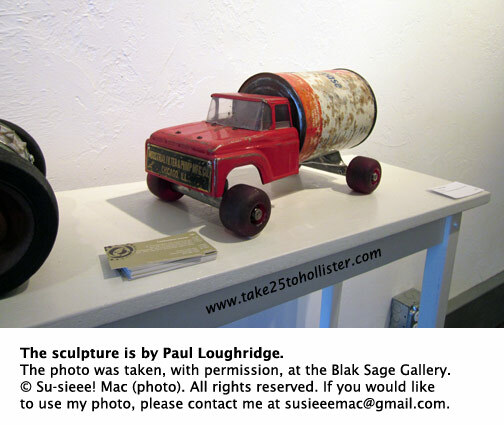 The Blak Sage Gallery is located at 727 San Benito Street (east side of the street between 7th and South Streets). The gallery is open Wednesday and Thursday, 1 to 5 p.m.; Friday, 1 to 6 p.m.; and Saturday, 12 to 5 p.m. For more info about the artists, check out San Benito County Arts Council Facebook page. 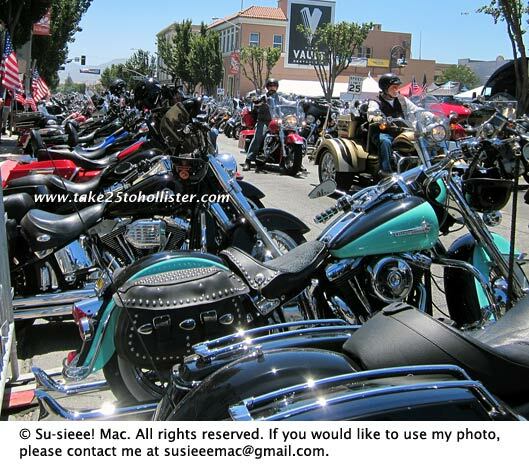 The Hollister motorcycle rally is back. Big time! It started yesterday and continues until 9 pm. tonight in downtown Hollister. 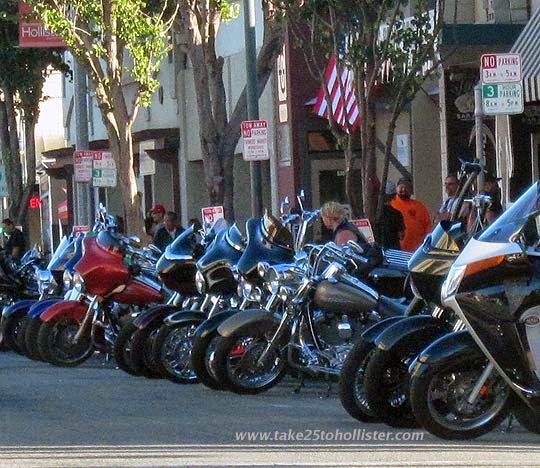 San Benito Street is closed from Fourth to South Streets for bikers to park their beauties. To check out the schedule, click over to the Official Hollister Rally Website. If you want to know about the origins of the motorcycle rally, stop in at the San Benito County Historic Museum at the corner of 5th and West Streets. 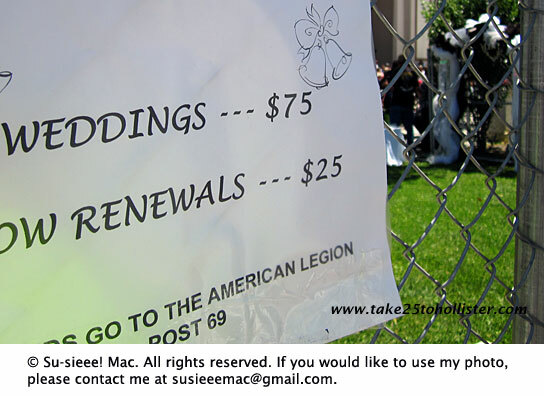 By the way, if you want to get married or renew your vows, the opportunity is available in front of the Veterans Memorial Building. Yes. 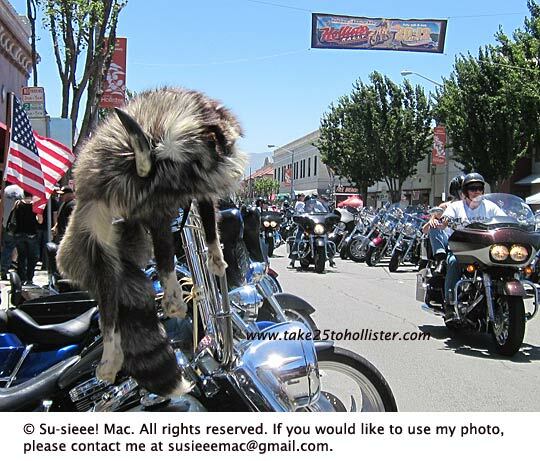 The Hollister Motorcycle Rally is officially on this year. The last one, a financial disaster managed by the City of Hollister, was in July 2008. Not that the motorcycle rally really disappeared. 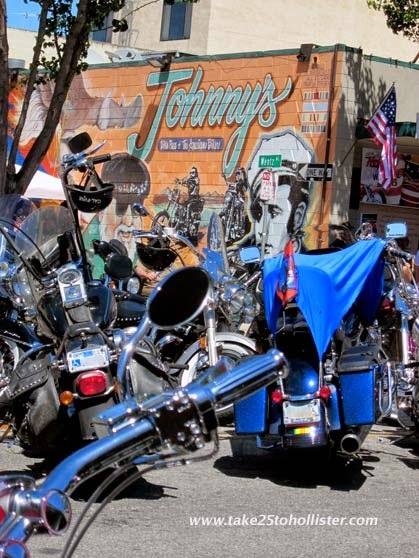 For four years, bikers continued to trek to Hollister over the July 4th weekend to pay homage to the Birthplace of the American Biker. So, it's back. July 5 and 6. Promoters and supporters are happy and excited. The word is that bikers can park themselves on main street and not in some distant lot from the original site where the 1947 riot took place. For details about the rally, head over to the official Web site. 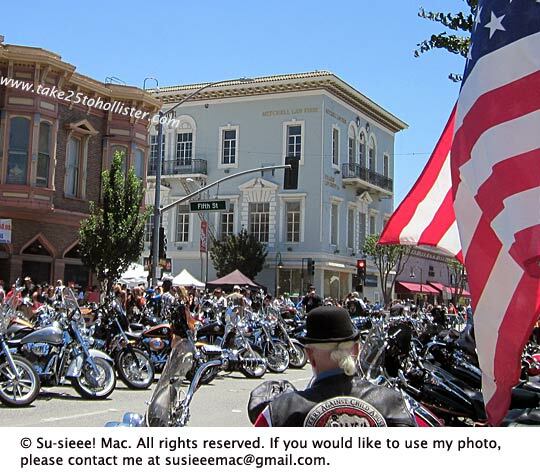 And, if you're interested in some history about the annual Hollister Motorcycle Rally, check out these links. Today marks the end of this week's theme: Bikers, Motorcycles, and Hollister. 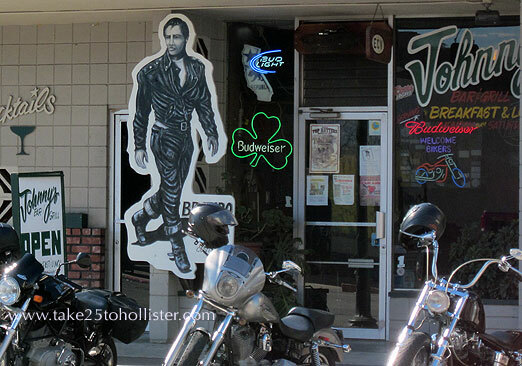 In The Wild One, some of the movie is set in a bar on Main Street, and in one scene a biker rides through the bar. 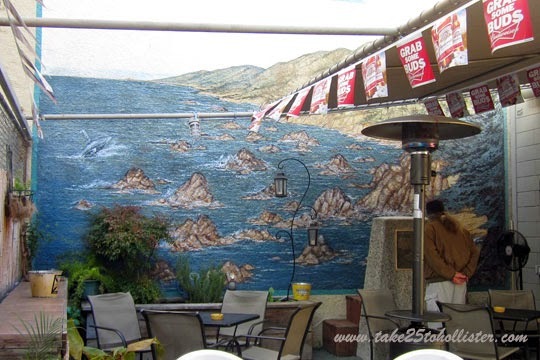 That bar in the movie, ladies and gentlemen, was based on the actual bar on San Benito Street—Johnny's Bar and Grill. So, did someone really ride through the bar? Several times each year, San Benito Street gets closed for a few hours for a parade. In at least three parades, we can count on seeing bikers take part—the Saddle Horse Show and Rodeo Parade in June and the Veterans Day Parade and the Lights on Celebration Parade in November. I thought the Blessing of the Bikes was an event that happened only locally. With the wonders of Google, I learned that it's a tradition that takes place nationwide. According to Wikipedia, this event started in 1999 as a mass blessing of bicycles at a cathedral in New York City. 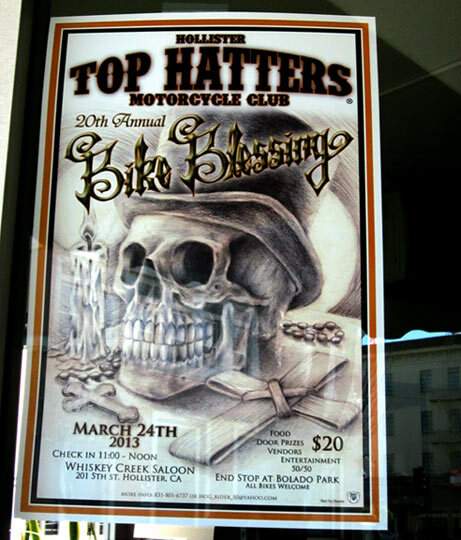 The local Bike Blessing is sponsored by the Hollister Top Hatters Motorcycle Club. 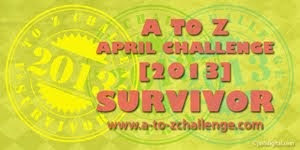 This year the event will take place on March 24. It starts with a check-in at Whiskey Creek Saloon on 5th and East Streets, between 11 a.m. and noon. The bikers then will proceed to Sacred Heart Church for the blessing ceremony. Afterwards, the group will be holding a BBQ fundraiser at Bolado Park, in which proceeds go to the San Benito High School Scholarship Fund. The public is invited. Click here for the details. 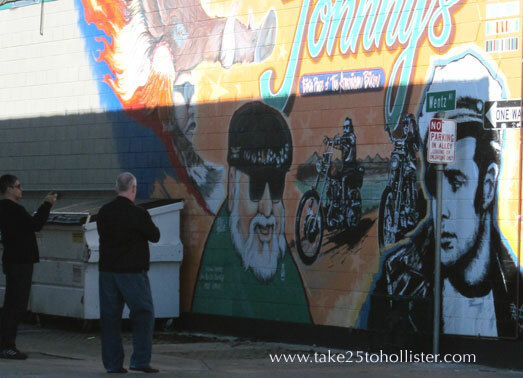 You can find not one, not two, but three murals around Hollister that feature a young, brooding Marlon Brando in biker mode. 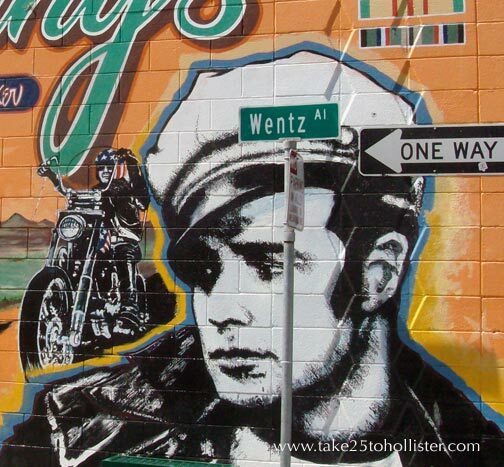 Marlon Brando in Wentz Alley. . .
Marlon Brando on East Street . . .
Marlon Brando on Technology Parkway . 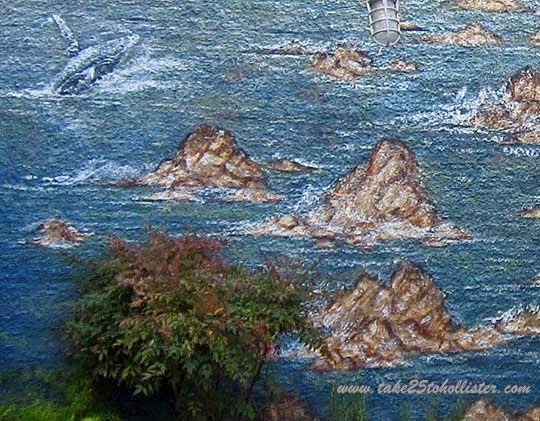 . .
Do you wonder why there are so many murals with Marlon Brando in Hollister? 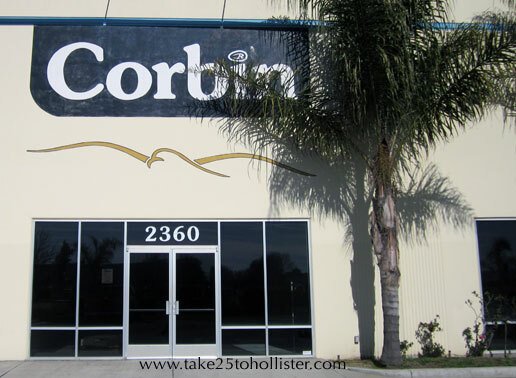 The answer: Read this post from the archives of Take 25 to Hollister. 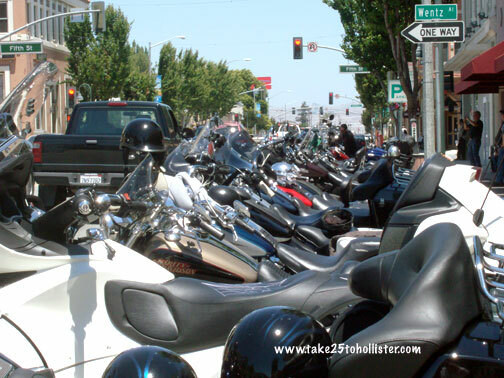 The theme this week, February 18 to 24, is Bikers, Motorcycles, and Hollister. . .
A common sight: Visiting bikers taking photos of the cool mural on Wentz Alley. 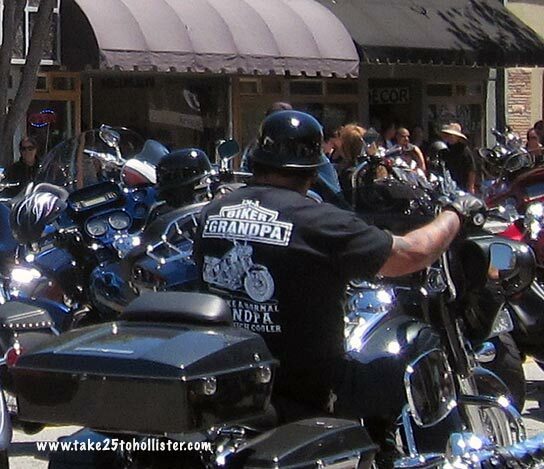 Bikers rumbling through downtown Hollister on any given day is a regular thing. 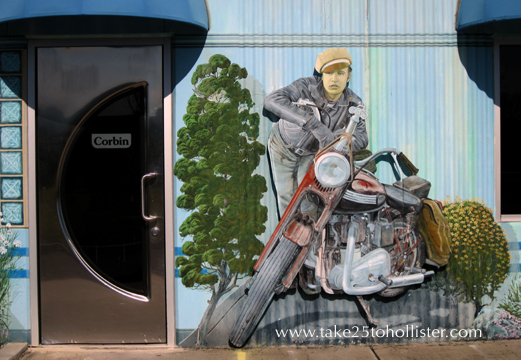 Many of them are visitors who have come to experience the Birthplace of the American Biker. They come singly, in duos, as trios, and in packs of four or more. Some just drive through as they head to near and far in San Benito County, while others pull up and rest a spell. 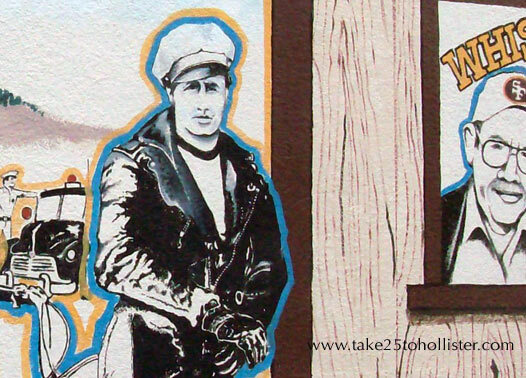 How did Hollister become known as the Birthplace of the American Biker? 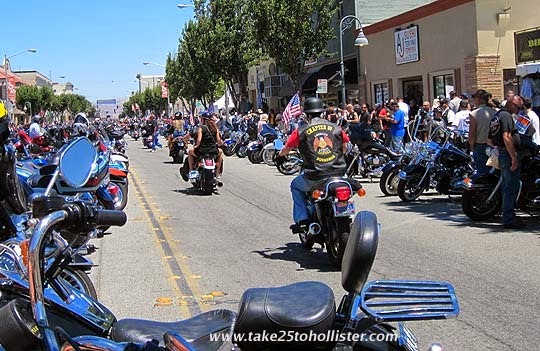 Because of what took place on the July 4th weekend in 1947, in which the City of Hollister decided to commemorate in 1997 with a 50th anniversary biker rally. 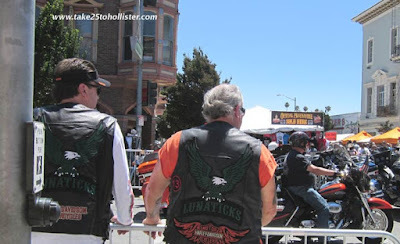 And, that began the annual motorcycle rally that became known to bikers far and wide. 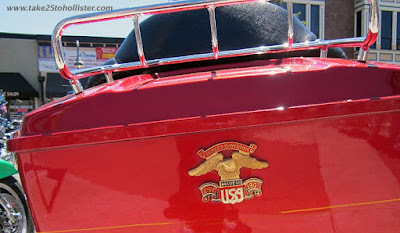 To read more about the 1947 event, go to this page at Take 25 to Hollister. 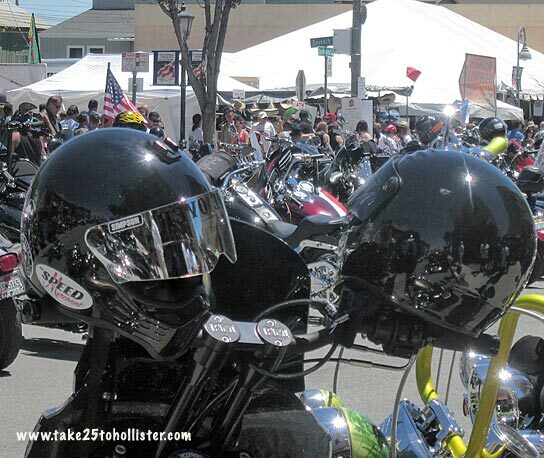 By the way, the official Hollister Independence Biker Rally is back this year: July 5 and 6, 2013. Head over to The Hollister Rally Web site for information.